You know, this event really highlights how badly suited Kate is for this role. She is surrounded by people whom have served their country for their whole lives, Queen Rania of Jordan does a great deal to ensure that woman and girls in the middle east receive an education and in turn can make something of them selves. What on earth is Kate going to say to a woman like her. Kate - "Oh yes, well, I attended st Andrews university and got a degree in Art History it was very important to me"
Queen Rania - "Yes I know and what did you do after you finished University "
Kate - "Hmm... ah.... Oh excuse me, I need to visit the ladies room..."
Queen Rania always carries hersef splendidly, always regal. Was the most beautiful new royal bride(IMO) Queen Jetsun Pema there? Seeing the photo of Kate and Charlene one simply has to remember the beautiful photos of Grace & Diana together, they cannot compare. Princess Charlene arrived at Windsor in a new glam avatar - blonde chopped hairdo, which she had done in April. The princess, who tends to opt for monochromatic dresses at public engagements, donned a baby blue, including the stilettos, ensemble. Her knee-length skirt paired with a full-sleeve, blazer style top added to her elegance and looked apt for a royal event. Charlene's counterpart, Catherine, Duchess of Cambridge, on the contrary, dazzled in a baby pink outfit, as she greeted the royal guests and, along with Princess Charlene, charmed one and all during the pre-reception party. The pleated Emilia Wickstead dress made her look like a bubbly young girl, as she mingled with her guests. The Duke and the Duchess of Cambridge were seen sharing a few jokes and some laughter with Princess Charlene and Prince Albert. I guess I need to find that reporters dictionary with the new definition of dazzled because I don't think Kate dazzled anything. I thought Kate looked totally out of place and NO I did not like the dress either. Kate needs to start looking like a grown up instead of a young girl. Absolutely, rogue and snokitty. Drives me mad that they just refuse to be honest about it. Dazzling? Get a thesaurus already. And how is that a compliment to be tagged a bubbly young girl at 30 years old? It's true, I'll give 'em that. I know that Prince William wants to seem like a cordial, nice person, but I *despise* that he always tries to JOKE with people. I hope he stops doing the that once he gets into his 30's. Kate has no clue, imo. I think she just tries to follow Pr.William's lead. 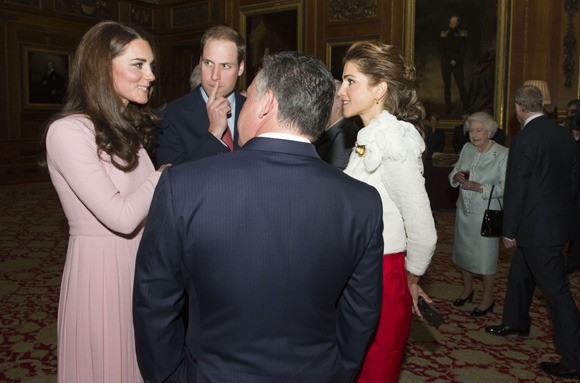 Also why is Kate always making some weird Fergie type face when she's at events? 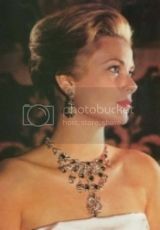 I like the dress but not the hair, a low chignon would have looked better and more sophisticated. What I really dislike is that they (and Harry) don't seem to mix well with other royals, they look kind of awkward and prefer their own company. I really like her! She's so cool. http://i.imgbox.com/aamM4fwR.jpg I'm glad HM had a good time. Why do I find it when I see royals with cameras. Carl Gustav and Prince Andrew. When's the Jubilee? I'm happy she-who-shall-not-be-named wasn't there. ^^Oh, WOW, does HM look like a cupcake, or what! Her sweet smiling face is so good to see. 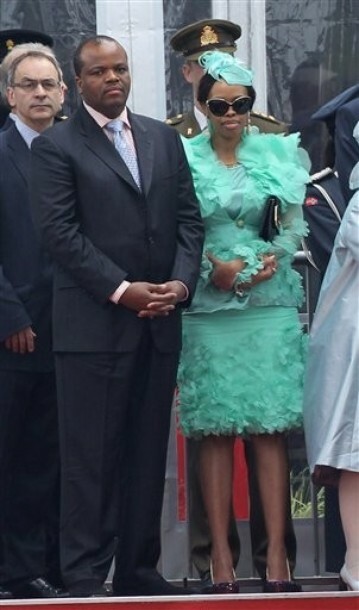 As for the Swaziland lady, she rocks her own style. She reminds me a lot of Queen Latifah (the singer/actress), of whom I'm very fond and loved her in 'Chicago'. yup I was thinking the same about the swaziland lady: i's like a mix between gaga, latifa and bonham-carter, it looks odd bu kinda cool at the same time and you need gut's to wear it! 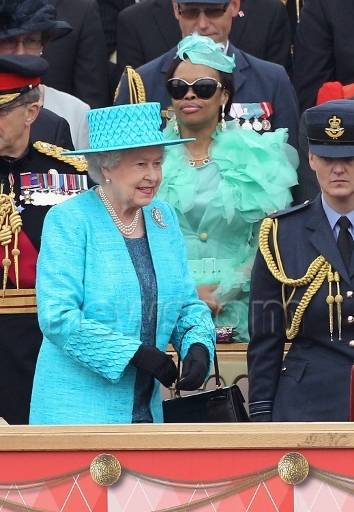 but I bet the colour clash wasn't intended no wonder she pulled a bit of a face when HM went by! ^^^Magnolia up there! What a good point you made there about the pastels and Kate's hard edge. Doesn't mix at all. And it was I and someone else who mentioned the wool; it's not the time of year for it at all. I somehow think she was trying to 'bulk up' her body with the pleats and the extra fabric weight. Yeah she can't carry off delicate and feminine(which are pastels)because she doesn't ooze it,it must difficult for her acting demure and pretending so much.She had to dress like that because there were important people there if it was up to her _IMO she would have tramp it up if there were no rules! she really looked terrible at this event. First of all, she's 30 years old, not 10. That dress is way too young on her. Second of all, pastels don't look good on her, she needs rich hues. Third of all, she's on home turf representing her Queen and her husband's family and she looks like she just rolled out of bed.